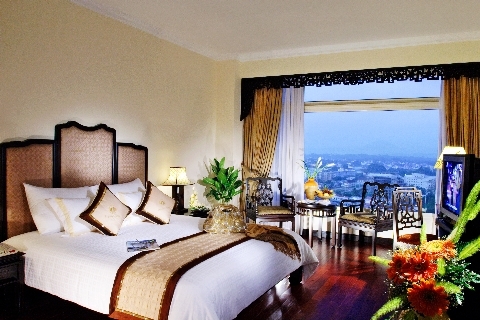 A high rise 17 storey- building, the Imperial Hotel is a remarkable landmark in Hue City. 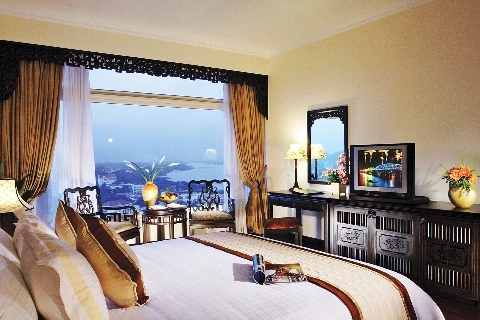 The Imperial Hotel is the first 5-star international standard hotel property in Hue. 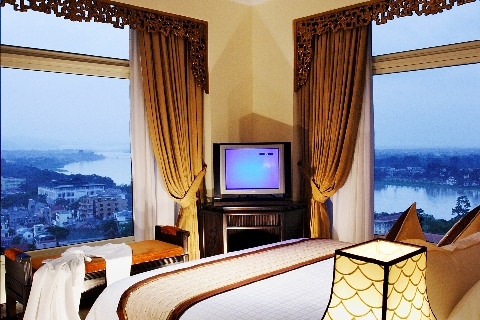 Only 15 minutes from the airport and with business and commercial district at its doorstep, there is no better located hotel in Hue City. 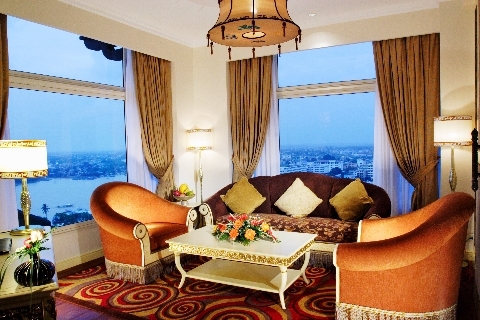 Situated right at the heart of the city’s central business district, the Imperial Hotel exceeds the expectations of today’s business, leisure and meeting guests with its stylish décor, full complement of amenities and five-star standard services. The hotel is an easy walk from all the excitement of the city. 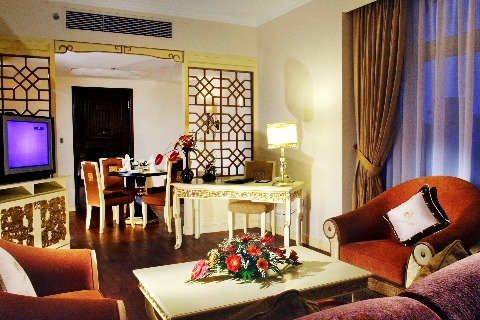 Guests can visit the famous Imperial Citadel and the surprisingly beautiful Perfume River. At the Imperial Hotel, accessibility is definitely a premium. 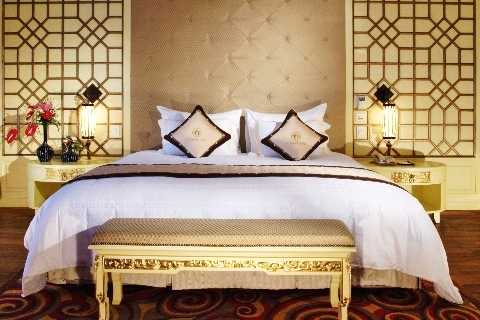 The hotel’s design reflects a mixture of elegant Eastern Asia and the classic imperial architecture and culture of the Nguyen Dynasty, with elaborate furnishing and interiors and exposure of cubes, colorful patterns and antique inspired materials. Modern accents bring the hotel into the present but it’s the luxuriously designed and reproduced antique qualities of this palace that make this unique hotel truly feel like a time capsule, very much unlike any other hotel in Vietnam. Guests will be impressed with 195 tastefully furnished and spacious rooms and suites which pay homage to an illustrious history. + Restaurants: (Asia/ European/International): + Restaurants: (Asia/ European/International): An abundance of international cuisine can be found in the hotel’s impressive food and beverage outlets. . Located at the hotel lobby adjacent to the business center, guests can do business or relax all day at the Piano Bar & Café, which is hugely popular for its drinks and regular afternoon tea. The bar also serves high quality down to earth seasonal menus. In the summer, the bar’s doors are thrown open to the adjacent , lushly flowering patio, an oasis of greenery and peace in the center of the bustling city. The Imperial Restaurant features an open show kitchen with spacious indoor and outdoor areas which provide a culinary theater in this exquisitely designed restaurant that features a mixture of traditional Vietnamese, specialty Hue-style cuisine, Chinese, Thai, Indonesian, other Asian dishes, as well as international favorites, catering to the dining preferences of every conceivable guest. The Yoshihara Japanese Restaurant can be taken as a real small Japanese house. With food ingredients and seasonings imported from Japan, all dishes are as authentic as they could be, meticulously prepared by Japanese-trained specialty chefs. The King’s Panorama Bar and the Starlight Lounge occupy the whole top floor of the building. Both serve some of the finest drinks in a very cozy atmosphere and have a long list of cocktails and wines to help tired businessmen and guests unwind. 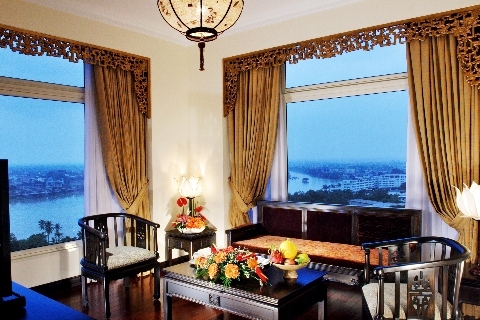 The bar and lounge offer a spectacular panoramic views of Hue City. Adjacent to these outlets is a large and spacious area where guests can have beautiful and unobstructed vistas of the city, river, island, mountain and historic monuments.